Two-time defending champion B.B. Owen Elementary remained perfect at the midway point of Texas Motor Speedway’s Speeding To Read S.T.E.A.M. Powered by Fun 2 Discover competition among 14 Dallas/Fort Worth schools participating in the year-long education program. B.B. Owen, the Lewisville ISD school based in The Colony, had 100 percent of its enrollment meet or exceed the Turn 2 reading goals and be the only school to remain perfect at the midpoint of the competition. Four other schools topped 70 percent led by Diamond Hill of the Fort Worth ISD, which was at 85 percent. The others were Dolores Huerta of the Fort Worth ISD (72%) and the Lewisville ISD duo of Stewart’s Creek (72%) and Homestead (70%). The other schools participating in this season’s competition are Brent (Little Elm ISD); Carl E. Schluter (Northwest ISD); Carter Park (Fort Worth ISD); Jay R. Thompson (Mesquite ISD); Price (Mesquite ISD); Ruby Shaw (Mesquite ISD); Sidney Poynter (Crowley ISD); S.M. Seabourn (Mesquite ISD) and Tom C. Gooch (Dallas ISD). The 14 schools and more than 7,500 students combined to read 72,794 books during the seven-week scoring period, with Diamond Hill (17,003) and Schluter (12,266) leading the group. The schools collectively have read 122,960 books at the midway point of the competition. Six different schools were represented among the leading Turn 2 individual readers by grade, with Stewart’s Creek fourth-grader Haylee Baker pacing the group with 550 books read for the period. The other grade champions were Brent kindergartener Jessica Arana (365 books), Diamond Hill first-grader Isabella Leal Sanchez (213), Schluter second-grader Evan Lewis (111), Homestead third-grader Noelle Prowell (248) and Carter Park fifth-grader Xavier Huerta (91). Each grade leader will earn a prize pack from Texas Motor Speedway and Speedway Motorsports, Inc. Properties. The top classrooms, based off average number of books read per student in the class, were the Diamond Hill fourth-grade class of Jose Carranza (98.76 books/student), Brent kindergarten class of Liz Scaife (77) and the Stewart’s Creek third-grade class of Roslyn Kelly (49). For Turn 2, the top-reading classrooms in fourth grade (Carranza) and first grade (Guajardo, Dolores Huerta) will earn special treats for each student compliments of Levy Restaurants, the official concessionaire of Texas Motor Speedway. In the midst of its eighth year, Speeding To Read S.T.E.A.M Powered by Fun 2 Discover has had 64 schools and 35,735 students participate and collectively read more than 5.2 million books. This year’s enrollment of 14 schools and 7,594 students increases the overall totals to 78 schools and 43,329 students. Texas Motor Speedway’s Speeding To Read S.T.E.A.M. Powered by Fun 2 Discover program is supported by the following partners: Fun 2 Discover, NASCAR, Verizon IndyCar Series, Lionel Racing, Speedway World, Levy Restaurants, The Speedway Club, Food for the Soul, aai Trophies and Awards of Plano, Jostens, Woolley’s Frozen Custard, Reunion Tower, Speedway Children’s Charities-Texas Chapter and Team Texas High Performance Driving School. 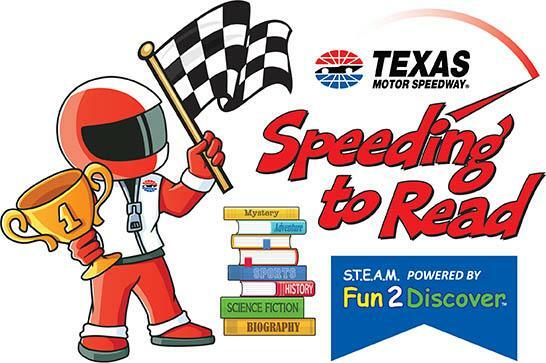 For more information on Texas Motor Speedway’s Speeding To ReadS.T.E.A.M. Powered by Fun 2 Discover program, please visit www.speedingtoread.com.